23 Nov 2012: Progress has been slow with raining weeks, dark evenings, and my putting more priority on getting the external work done first. 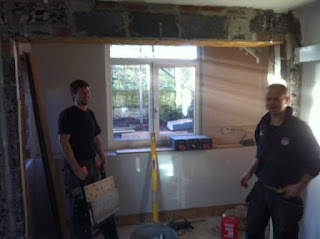 We decided to bring in Chris McCabe and Alan Huddleston to finish off the interior. 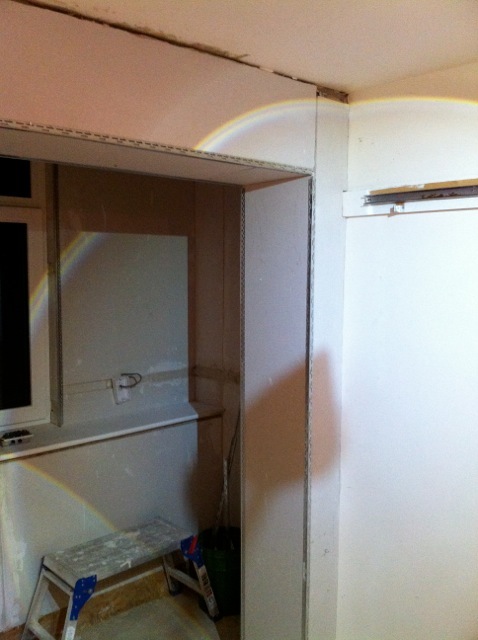 they are quicker and can do the work more professionally than I could, with their plastering and joinery skills. I have to try to get the Sunbox working as soon as possible, so I accept that we have to have help to finish the extension. Chris and Alan's website is: mccabehuddlestonconstruction.co.uk/ I was impressed at how well they got on in the first day. Chris and Alan arriving on Friday morning…. cup of coffee and then get on with it! I had to go to the University all day, so Chris took some progress photos and emailed them to me in the evening. 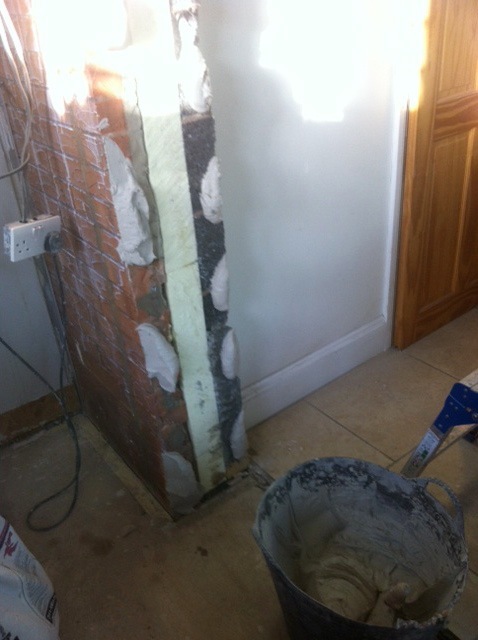 The brickwork over the opening has to be faced with Thermalboard to prevent thermal bridging because this same wall is also the outside wall. If you want to glue board to brickwork you have to prime the brickwork with adhesive, and here, the PVA is going on. 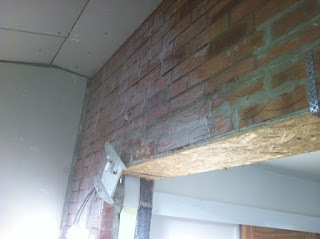 The boards lining the brick opening were a bit wobbly and Chris thought it better to take them off and continue the Dab and Plasterboard around the pier. It is also cheaper than doing it with Plywood, and less painting in future. 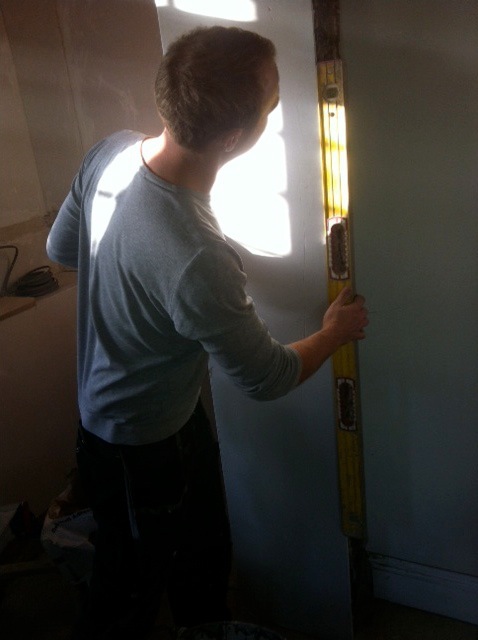 Walls are being checked for flatness and verticality…. I hope they passed! Chris read the blog before coming so knows about the 'Time Capsule' behind the yellow insulation! 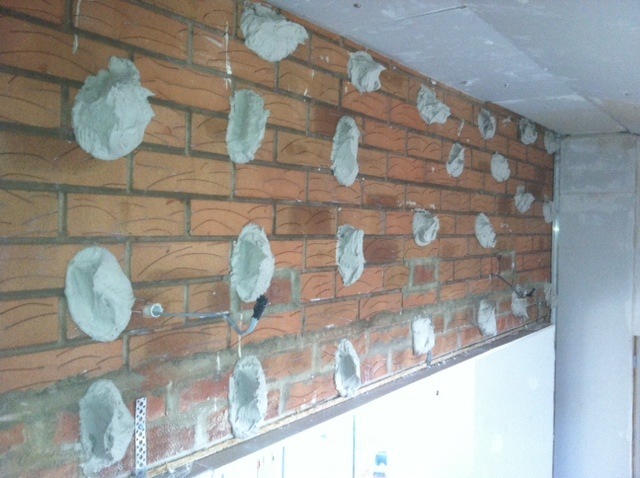 A lot of dabs going on for the thermal board above the lintel. Good progress made in the first day, all surfaces are boarded and waiting to be skimmed next week.